University Of Toronto shut down the controversial event. OTTAWA — A pledge by Conservative Leader Andrew Scheer to yank federal funding from universities that fail to uphold free speech wouldn't apply to a decision by the University of Toronto to ban a nationalist rally from campus, his spokesman said Wednesday. "No," was Jake Enwright's answer when asked whether the university's move would risk its federal funding under a Scheer government. While Enwright could not articulate exactly why the decision to bar the Canadian Nationalist Party event didn't meet the threshold, he said Scheer will be working with universities to prevent loopholes for events that risk violating Canadian law. "Mr. Scheer is committed to working with the universities to ensure that any policy he brings forward does not become a platform for hate speech," Enwright said. Scheer made the promise during his campaign for the leadership of the Conservatives, linking it to a number of instances where pro-life and pro-Israel events were turned away from university campuses after protests erupted. 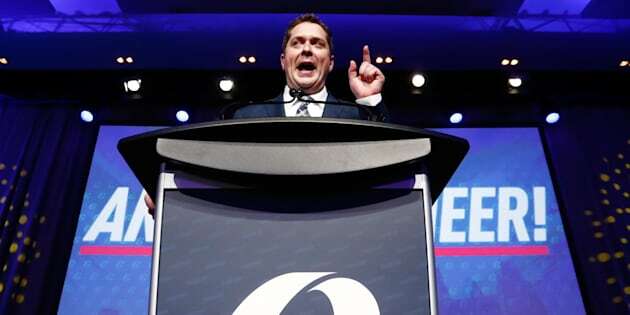 "The foundation of our democracy is the ability to have a debate about any subject," Scheer said during his leadership victory speech in May, to raucous cheering and applause. "That is why I am so committed to defending free speech. I will withhold federal funding from universities that shut down debate and can't stand different points of view." Scheerhadn't yet articulated how the policy would work, in part because of another platform commitment, letting Conservative grassroots shape the party's policy at next year's convention. But the decision Wednesday by the University of Toronto to reject the Canadian Nationalist Party event has put the idea to an early test. The nationalist group's 21-point platform includes a claim that the founding peoples of Canada — which it describes as being of European descent — are being suppressed. It also calls for amending the charter, "characterizing ethnic nationalism and removing its stance of multiculturalism," and for "citizenship requirements be returned to founding criteria, resulting in the immediate deportation of citizenship-holding convicted terrorists." The group is planning an event for mid-September to discuss the nationalist movement, and had said on its Facebook page that it would be held at the university. But university president Meric Gertler said bigotry, hate and violence have no place on campus, condemning the deadly clash between protesters and white supremacists in Virginia over the weekend that left one woman dead and 19 others injured. The group's leader, Travis Patron, said in a video posted Wednesday they are not a white supremacist movement. Patron also said the event will be held elsewhere. In developing his policy, Scheer also cited University of Toronto professor Jordan Peterson, who was the target of on-campus criticism for his refusal to use gender neutral pronouns, and who has become a hero of the free speech movement. Peterson had been scheduled to participate at an event next week at Ryerson University about the stifling of free speech on campus. On Wednesday, the university cancelled the event, citing safety concerns. The safety of our community is a top priority. In light of recent events, Ryerson has made the decision to cancel the Aug 22 event. Enwright said he was unfamiliar with the incident and was unable to say whether Scheer's policy would apply in that instance. Among the other speakers scheduled for that event was Faith Goldy, whose coverage of the Virginia events for conservative news outlet The Rebel prompted one of the site's co-founders to quit and two commentators to resign. Goldy and the outlet were pilloried for appearing to sympathize with Richard Spencer, whose manifesto for the Charlottesville event considers Jews as distinct from other Europeans, and calls for the creation of racially and ethnically defined states. The issue prompted Rebel owner Ezra Levant to outline in a memo to staff that the organization covers the so-called "alt-right" — a U.S.-based offshoot of conservatism that combines elements of racism, white nationalism and populism — but isn't itself part of it. Levant isn't the only conservative whose has sought to publicly make such a distinction. Conservative MP Garnett Genuis did a live broadcast on Facebook from his back porch this week in an attempt to clearly draw a line, motivated, he said, by the events in Virginia. Among other things, he pointed out that the nationalist movement emphasizes racial inequality, while Conservatives emphasize equality of opportunity. Those in the alt-right talk about strong central government, he said, while traditional conservatives talk about more limited government. "You'll hear people today, any time they don't like someone on the right they'll trot out these labels without understating that national socialism, that fascism, that alternative right thinking, comes out of the left."